Clean up: Will Dr Roof clean up all the debris? Yes all of the garbage will be cleaned up and hauled away. We will park a trailer in your driveway or on the street so we can dispose of all of the debris. Every effort will be taken to do a thorough clean up of your yard using rakes, brooms and magnets. It is reasonable however to expect to find some nails and shingle granules that were left behind during the clean up process so please be careful. A reroof generates 5000 to 10,000 pounds of garbage and approximately 5000 nails were used to secure the original shingles. Contract: Can there be additional charges to the contract I signed? There can be additional charges over and above the base roof price. These charges would typically be shown on the contract or under the terms and conditions of the contract. Any board replacement or structural repairs would be at an extra charge if they were not included in the original contract. Any unforeseen problems such as poor or non existent flashings that require replacement, plumbing stack repairs and chimney repairs would be at an extra charge. Any work that is required that was not specifically stated on the contract would be at an extra charge. Costs: How much does it cost to replace the shingles on a roof? The cost for a small bungalow could be approximately $3000.00 depending on the above noted factors. Add an attached garage and the price goes up. A mid size bungalow with an attached garage could cost anywhere from $5000.00 and up. If you have a steep roof or a low slope roof the price goes up accordingly. A 2 ½ story steep roof would cost even more due to it’s degree of difficulty. The only way to get an accurate price is to have a qualified estimator come out and do an evaluation and inspection of your roof. Estimates: Do you offer free estimates? Under most circumstances there is no charge for us to come out to your home and give you a quote. There are some circumstances however that charges may be required to complete certain estimates. This would be explained to the customer in advance. We do not offer free estimates on smaller repairs. A minimum service charge of $150.00 is applicable on most repair calls. While an estimate may be free to the homeowner it does cost the contractor time and money to come out to your home and complete an estimate. While we appreciate the opportunity to give you an estimate we do so under the premise that we have a reasonable and fair opportunity of getting the job and completing the work for you. Eaves edge: What materials should be used on the eaves edge on my roof? As per the building code roofs with slopes of 4/12 to less than 8/12 you can use glass base sheet or ice & water membrane at the eaves edge. Felt or poly is no longer acceptable as an eaves edge application. For roofs with slopes 8/12 and over or unheated roofs no eaves edge underlayment is required although we recommend that one be installed. If you have an overhang of 24 inches over a heated roof area you must have a minimum of 44 inches of eaves edge underlayment. Many companies use products that are 36 inches in width which do not meet the building code requirements. That is why Dr Roof uses a 44 inch ice & water membrane. Make sure your contractor is meeting the minimum requirements. Drip flashing can also be installed at the eaves edge but is completely optional. It is only required on low slope roofs. Eavestroughs: What size of eavestrough should I install on my house? The old standard was 3″ or 4″ troughs. Five inch eavestroughing is the new industry standard and is used on most homes. Six inch is available but is more of a commercial application and not typically used on residential homes. Ice dams: What are ice dams? How can they be avoided? 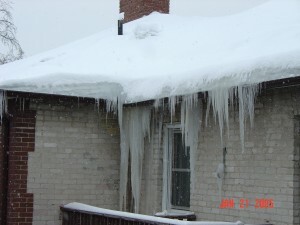 Ice dams are formed by continual thawing and refreezing of melting snow. Large masses of ice develop as snow on the upper part of the roof melts. The water runs under the snow and refreezes at the edge of the roof. Additional snow melts and forms pools against the dam gradually causing water to back up the roof often getting under the shingles and eventually leaking into the house. Poor or non existent vapour barrier which allows heat to escape into the attic. Air leakage through light fixtures, plumbing stacks, attic access hatches and fan vents etc. Insufficient attic insulation allowing warm air into the attic and melting the snow. Naturally occurring ice accumulation due to various weather conditions. Ice dam solutions: Are there solutions to my ice dam & attic frost problems? Yes there are solutions to ice dam and attic frost problems but they are usually very expensive to solve. Ice dam and condensation problems occur because warm moist air is leaking into the attic from the living space. You must eliminate these air leaks to eliminate the problem. The only way to do this is by installing a proper vapour barrier. We can do this by cleaning out the cavities and spraying in a 2 lb polyurethane foam insulation. This will seal the air leaks and insulate the attic. You could expect to pay anywhere from $10,000.00 to $20,000.00 depending on the size of the job. You can do a less thorough job by sealing up light fixtures, attic access hatches and other sources of air leaks. You could also try lowering the humidity level in the living space. See Industry topics for more information on these and other problems. Ice dams & ice membranes: Will ice & water membranes eliminate my ice dam problems? No, ice & water membranes will not eliminate your ice dam problems. Ice & water membranes may help prevent water from entering into the living space but it does nothing to address the formation of the ice dam itself. There is also no guarantee the ice & water membranes will prevent moisture infiltration. Go to Industry Topics for more information on ice dams, condensation and ventilation. Permits: Are building permits required? A permit is not required to complete a typical roofing, eavestrough, soffit, fascia or siding job. Roof Maintenance: Is my new roof maintenance free? All roofs require some maintenance to prolong its life expectancy. Your roof is exposed to extreme weather conditions 24 hours a day, 7 days a week, 365 days a year. Roofs should be inspected for damage so that it can be repaired before it causes more severe problems. Eavestroughs should be cleaned at least 3 to 4 times a year. Any tree branches that come into contact with the shingles should be trimmed. Build up of debris in the valleys or behind chimneys should be cleaned so as to not produce a blockage. Dormers, chimneys, plumbing stacks and vents may require periodic maintenance and resealing, especially on homes that have been reshingled more than once. Shifting or movement of the structure may cause problems to develop that would require some maintenance as well. Birds and rodents build nests or cause damage that requires attention. Satellite dishes: What happens to my satellite dish during the roofing process? Dr Roof will remove and reinstall your dish but the customer would be responsible to have it recalibrated if required. Generally this is not required. Shingle replacement: When should I consider replacing my shingles? Don’t wait until your roof leaks before replacing your shingles. Your shingles are like tires on a car. They wear out gradually over time and at some point they become unable to perform they way they were designed to. If you leave it too long not only will you be replacing the shingles but you will also have interior repairs to deal with, possible deck rot to replace and wet insulation in the attic. Soffit & Fascia: do I need to remove the plywood soffit? You do not need to remove the plywood soffit. Additional soffit holes will be cut into the plywood soffit to allow for more soffit ventilation. Synthetics: Do you recommend synthetic underlayments? Synthetic underlayments are relatively new in the roofing industry and have been used in the Winnipeg market since approximately 2010. These synthetics are being sold as a substitute for #15 felt tar paper as a shingle underlayment. The benefits to synthetics are increased tear strength, quicker installation, easier handling and the ability to withstand being exposed to the weather. In the United States, where roofs are left exposed for days, weeks or even months on end, the ability to be to left exposed is a benefit. In Winnipeg, roofs are not left exposed to the weather so most of the synthetic benefits are not realized in our market. There are many brands of synthetics such as Owens Corning’s Deck Defense, IKO’s Cool Grey, BP’s Deck Guard, CertainTeed’s Diamond Deck and many other generic brands. What all of these products have in common is they are all non breathable and are therefore considered to be vapour barriers. There is concern and discussion in the roofing and construction industry that putting a non breathable synthetic underlayment on the complete roof may cause moisture to be trapped in the attic or in between the synthetic and the roof decking. Nobody is completely sure as these products do not have a long enough track record in the Winnipeg market. What we do know is that all manufactures state that it is critical that synthetics only be installed on properly ventilated roofs. Many homes in Winnipeg, due to their construction, are not and cannot be properly ventilated so synthetics, based on the manufacturers’ recommendation, should not be used in these cases. Dr Roof believes that any benefit a synthetic underlayment may provide should be weighed against the potential problems a non breathable underlayment may cause. Until these products have a proven track record and there is a better understanding of their performance on roofs in our climate Dr Roof will continue to promote #15 felt as the best option as a roof underlayment. Felt is breathable, has been used for decades, has a proven track record and properly installed, #15 felt will perform as well as a synthetic without the risk of putting a vapour barrier on your roof. One synthetic product that is breathable is GAF’s Deck-Armor. If you insist on using a synthetic this is the product you should consider as it is the only breathable synthetic underlayment in our market as of right now. As you might expect Deck-Armor is more expensive than the other non breathable synthetics but we believe it is worth it. #15 felt paper: Is felt underlayment (or tar paper) required on my complete roof? Although felt is not generally required on the complete roof Dr. Roof, and the shingle industry as a whole, strongly recommends the use of a felt underlayment on the complete roof. You get added protection against leaks caused by ice dams and wind driven rain. You also get secondary protection in the event shingles blow off in a wind storm. Plus you will have added protection against leaks when the roof begins to age and deteriorate. Ventilation – Why is ventilation important? Proper attic ventilation is required by the building code and by the shingle manufacturers to meet their warranty requirements. In theory the air in your attic should be the same temperature as the outdoor air. Ventilation allows warm air to exhaust allowing your attic to stay cooler in the summer months. There are many varying opinions as to the effectiveness of attic ventilation in respect to it’s function, especially in regards to the winter months. Every home is unique and the requirements may vary from home to home. A trained contractor should be able to advice you on your needs. Please see Ventilation under Industry topics for additional information. Vents & ice dams: Will adding vents eliminate my ice dam and condensation problems? Adding vents will not solve these problems. Ice dams and condensation problems occur because of excessive heat loss from the living area into the attic or ceiling cavity. The only way to properly address these problems is by eliminating the heat loss and air leakage. Opinions differ as to the need and effectiveness of vents in an attic. While building codes and the shingle manufacturers require a certain amount of ventilation The Canada Mortgage and Housing Corporation state that additional ventilation may contribute to the problem. Go to Industry Topics and click on Ice Dams or Ventilation for more information. Warranty – Who covers the warranty on the shingles? All shingle warranties are provided and handled by the shingle manufacturers. In the unlikely event of a warranty claim Dr Roof will assist you in the process of filing a claim but ultimately you will deal directly with the manufacturer. Warranty on workmanship – What is covered under Dr Roof’s workmanship warranty? Workers Compensation: Are your workers covered by Workers Compensation? All of Dr. Roof’s workers are covered by Workers Compensation Insurance. As a Dr Roof customer you are protected from any liability in the event one of Dr roof’s employees suffers an injury on your property. Many roofing companies use sub contractors, which are separately owned companies, and have little to no control as to whether they are covered or not. Often times crew members may be covered but the crew chief, as the owner of the sub contracted firm, has no coverage. If any worker gets injured on your property and he is not properly covered you are liable for the workers compensation claim. Yard & house access: Will we have access to the house and yard during the roofing job? Yes you will have access to the house but you must understand that your house and yard will be a construction site. It will be very noisy, messy and dangerous with men working overhead. While we will accommodate you in any way we can, we would ask that all children and pets be kept indoors and away from the immediate work area for their safety and protection. Roofing: What can I expect during the process of getting my roof done? First and foremost your yard will be a construction site. A typical job will generate 5000 to 10,000 pounds of garbage. The process of roofing is quite messy and noisy. A crew of men will be on site for approximately 1 to 3 days or longer for larger jobs. We will require access to your driveway, to hydro and an outdoor water source. During the roofing process your house will vibrate and shake so if you want to secure any loose objects such as chandeliers, wall mounted objects or other valuables please do so. We are not responsible for any damage that occurs during the normal process of completing the roofing job. Please be patient during this process and allow the crew to complete their work in an efficient manner. We will do a complete job site clean up using rakes, brooms and magnets and haul away all of the debris. Roofing: Will you install customer supplied material? Under certain circumstances we would consider installing customer supplied shingles but only if they were #1 CSA approved material. We would advise against it though because any savings would be minimal if any and warranty issues may be more problematic for you in the future. We would not install discount clearance shingles under any circumstances. Roofing: How long does it take to reshingle a roof? The average job takes one to three days weather permitting. The length of time depends on the size and the degree of difficulty of each job. A typical 1000 square foot walkable roof would take one day whereas a large 2 storey steep roof could take about 2 to 3 days or longer. An experienced, well equipped roofing crew will complete a job quicker and more efficiently than other less experienced roofers. Roofing: Can I strip my own roof and save some money on the job? It is our experience that this is not advisable and saves the customer very little if any money. Scheduling is the biggest problem. Trying to coordinate when you will be ready for our crew can cause conflicts with scheduling. It can be a big problem if there are any delays and if there is any rain in the interim. You don’t want your house exposed to the elements overnight because if it rained your entire house would be ruined. It is also much more difficult to strip the roof than most homeowners imagine. Disposal of the old roofing material must also be factored in. Unless you have access to a dump truck or a large trailer you could end up making many trips to the landfill. Once you are at the landfill, all of your debris will need to be unloaded again by hand. Inevitably most homeowners that have tried this wish they had never taken on the job. Roofing: Do I need to be home while my roof is being done? It is not required that you be home during the job. The roofing process is very noisy and disruptive so many customers prefer not to be home. We would like a contact number to reach you in the event of any unforeseen circumstances or problems that may develop on the job. We would also like to be able to keep you informed of any additional charges that may arise. Roofing: Can I install new shingles over my existing shingles? While you might think that this will save you money in the short term it will not serve you well in the long term. The life expectancy of your new shingles will be shortened if installed over top of existing shingles. You will not have had the opportunity to inspect the decking underneath the old shingles and replace any rotten wood if required. Cosmetically the underlying shingles will telegraph through the new shingles and be somewhat visible. As a general rule installing new shingles over top of existing shingles is not recommended. Roofing: Is it necessary to remove the plastic cellophane tape on the back of shingles? It is not necessary to remove the plastic cellophane tape that is applied on the back of shingles. This tape is applied during the manufacturing process and prevents the shingles from sticking together in the package. Roofing: Will my roof look as good as new after I get new shingles installed? With all of the shingle style and color options available today you can easily transform your old roof into a beautiful showpiece. Your roof might be the most visible feature on your home and new shingles can improve the curb appeal dramatically. While new shingles will improve the overall look of your home it will not hide structural irregularities such as sags or dips in the roof or sagging overhangs. New shingles will follow the contours of the structure and can make these deficiencies more prominent. The current laminated dimensional shingles will assist in masking these deficiencies. When a roof is reshingled flashing details at chimneys, dormers and stucco walls have been disrupted and will never be like new. This could mean having to install surface flashings or to surface seal areas on a roof depending on its condition. Each house is unique and requires its own special attention to ensure that it is trouble free for years to come. With some homes this may require periodic maintenance. Roofing: What happens if it rains during the job? Every effort will be taken to protect your home from the elements. If the weather is overcast with a chance of rain we would only open up portions of your roof that could be easily closed off in the event of rain. Our crews are fully equipped with tarps in the event of bad weather. We follow the weather through radar on a regular basis and we are in contact with our crews at all times. Rest assured you are in good hands with Dr. Roof.